Updated on 10/12: Roscoe Mitchell is slated to be accompanied by bassist Doug Mathews and percussionist Michael Welch. Composer and multi-instrumentalist Roscoe Mitchell becomes a Master Artist at Atlantic Center For The Arts for their October installment of its quarterly residency program. Mitchell’s history and influence on creative, improvised music since the mid-1960s shouldn’t be underestimated. The reedist joined innovative Chicago pianist Muhal Richard Abrams’ Experimental Band in 1961, establishing disciplines outside of the orthodoxies and strictures of then-contemporary jazz music. Abrams became an eventual founder of Chicago’s non-profit Association For The Advancement Of Creative Music (AACM) in 1965, with Mitchell quickly following as a member. Just prior to his 25th birthday, he recorded the first album out of the AACM camp- accurately named Sound for its aesthetic innovations. While Sound was influenced by eight years of existing free jazz recordings, he added a palette of new, non-traditional gestures to the language of jazz, including a new category referred to as “little instruments.” In addition to the inclusion of small bells and shakers, 1966’s Sound boldly featured recorder and harmonica- near anathema in swing-based jazz. Mitchell had added a new and substantial reference point to the experimental wing of jazz already featuring assertive, brilliant statements from Ornette Coleman, Cecil Taylor, Sun Ra, Jimmy Giuffre 3, Eric Dolphy, Archie Shepp, Bill Dixon and John Coltrane- all musicians then associated with New York City. In 1967, the Roscoe Mitchell Art Ensemble featured trumpeter Lester Bowie, bassist Malachi Favors and drummer Phillip Wilson. Reedist Joseph Jarman joined the Art Ensemble in 1967, creating the core lineup of one of creative jazz music’s most iconic, innovative and entertaining ensembles. Following the AACM guidelines of presenting their ensembles and artists live in combination with one another, The Art Ensemble of Chicago played their last Second City concert of the decade in May of 1969, becoming artistic emigres jazz-style- transforming into Parisians as substantial and marginal American improvisors had for decades.The now drummer-less AEC made a significant splash in Parisian print media and recorded there by July 1969, roughly a month after arriving. The L’express newsweekly declared the Chicagoans, “incorporate anything of value, classical, European, Hindu, African, seemingly without any prohibition against any kind of process of working with sound.” Their 1969 trans-Atlantic transformation led to a release of eight albums that year, creating the band’s international reputation, largely without a dedicated drummer, with all members taking on rotating roles of non-trap kit rhythm maker. As was common with most AACM units, Art Ensemble’s concerts were noisy, Afro-centric, African-American referencing, visual, theatrical and occasionally bordering on the absurd. In other words, brilliant to many, with some of their French fans able to witness them of bills with rock-centric artists such as Frank Zappa’s Mothers Of Invention. The collective returned to the U.S. in 1971, with all members also pursuing parallel side projects. Mitchell gained a reputation for adding his own turns on modern classical chamber techniques to his widely-established improvisational resume. Mitchell created a new unique and identifiable working group, recording his Sound Ensemble for the first time in 1980, all the while continuing to record and perform with the now-established and financially viable Art Ensemble Of Chicago. By the early 1990s, Mitchell created another notable configuration with his Note Factory outfit, featuring reeds, trumpet, two pianists, two bassists, and two drummers. Over the decades, Roscoe Mitchell’s music has referenced the sentimental and the new with bracing, self-developed instrumental techniques. Dense improvisations can be framed by the blues, pre-bop jazz, spoken word recitations, character voices, timbral percussion features that seem to be in a duel with silence, modern chamber ensemble arrangements and non-jazz noise bursts. 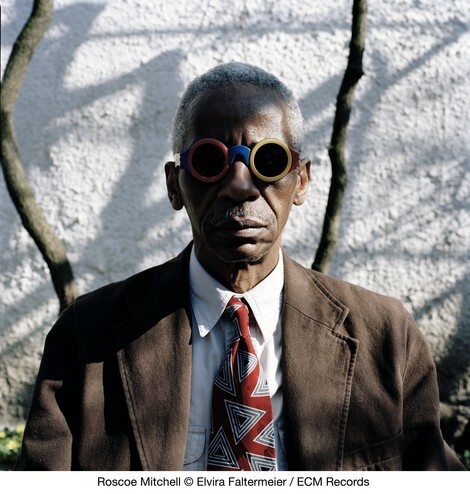 Roscoe Mitchell’s extensive and sometimes elusive discography through the mid-first decade of the 21st century is collected here. Tags: AACM, Art Ensemble Of Chicago, Atlantic Center For The Arts, Civic Minded 5, cm5, Roscoe Mitchell, Timucua Arts Foundation. Bookmark the permalink.